NETWORK UPDATE: THE BACHELORETTE gained 0.1 in final ratings, but THE ISLAND fell by 0.1. Also down by 0.1 each were the reruns of THE ORIGINALS and JANE THE VIRGIN. CABLE HIGHLIGHTS: The US vs Colombia WOMENS WORLD CUP QUARTERFINALS on Fox Sports 1 took the cable night at 1.79. 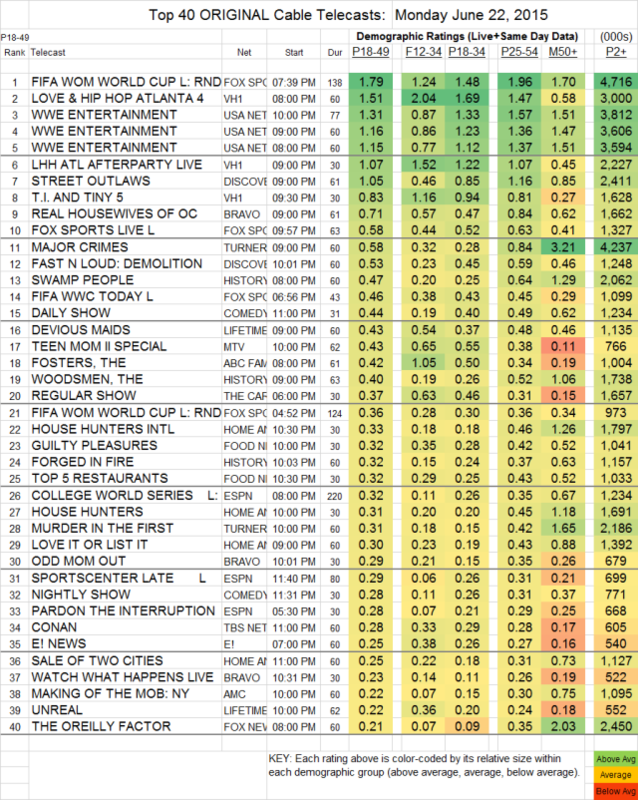 VH1’s LOVE & HIP HOP ATLANTA was in 2d place, but still went up a tenth from last week to 1.51, with the AFTERPARTY lead-out up 0.09 to 1.07, and TI & TINY up 0.03 to 0.83. USA’s WWE telecast was at 1.31-1.15 over its 3 hours, down about 0.15 after Hour 1. On Discovery, STREET OUTLAWS lost a tenth to 1.05, and FAST N LOUD rose 0.03 to 0.53. Bravo’s REAL HOUSEWIVES OF ORANGE COUNTY rose 0.07 to 0.71, with ODD MOM OUT holding at 0.29. At TNT, MAJOR CRIMES gained 0.06 to 0.58, and MURDER IN THE FIRST grew by 0.03 to 0.31. History’s SWAMP PEOPLE was at 0.47, and THE WOODSMEN was at 0.40. Lifetime’s DEVIOUS MAIDS lost 0.03 to 0.43, and UNREAL dropped a tick to 0.22. MTV keeps calling its TEEN MOM episodes “specials,” which doesn’t make much sense on a weekly basis–perhaps a reader can explain. In any case, this week’s was up a hundredth to 0.43 (and up 0.07 in the F12-34 demo to 0.65). On ABCFamily, THE FOSTERS gained a tick to 0.42 (and had a better night in F12-34, up 0.15 to 1.05), while BECOMING US dropped 0.05 to 0.10. AMC’s MAKING OF THE MOB shed a tenth to 0.22.